Erich Georg Anton Sebastian von Falkenhayn (1861-1922) was born in Graudenz, in West Prussia, on November 11, 1861. He served as Chief of the Imperial German General Staff for part of the First World War before his eventual dismissal by Kaiser Wilhelm II. Having joined the army at an early age Falkenhayn served as a military instructor to the Chinese army in 1899, where he remained until 1903. During the Chinese Boxer Rebellion he was a member of the German General staff, seeing action when the Allies marched to relieve besieged Peking. Upon his return to Germany, Falkenhayn continued to serve on the German General staff, and was appointed Prussian Minister of War in 1913. Whilst in this role he and Helmuth von Moltke, then Chief of Staff, frequently clashed. 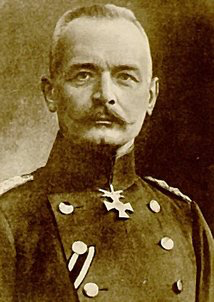 However, with the declaration of war in August 1914 and the German setback at the Marne, the Kaiser, Wilhelm II, dismissed Moltke and replaced him with Falkenhayn on September 14, 1914. Falkenhayn’s cautious nature appeared to make him well-suited to the realities of trench warfare, unlike many of his contemporaries. He was inclined to consider defensive rather than offensive operations – a sound strategy but one ill-suited to the Eastern Front. His approach led him to reject an ambitious plan to capture the entire Russian army championed by Paul von Hindenburg and Erich Ludendorff. Falkenhayn however believed that the real war was being fought on the other front, the Western Front. He conceived the idea of besieging the historic French city of Verdun in early 1916, of “bleeding it white” as he phrased it. He planned to draw the bulk of the French army into the Verdun salient, thus effectively tying up the French army, and then to methodically destroy them with concentrated artillery fire. Certainly French losses at Verdun were significant, as were German casualties. It succeeded in diverting French attention solely towards the defence of Verdun, to the extent that the British offensive on the Somme on July 1, 1916 was executed as much as anything else to provide relief for the French forces at Verdun. Even so, the German Verdun offensive was ultimately a failure; indeed, by the time the Somme offensive was started the French were already beginning to claw back ground. With the failure of the Verdun offensive, for which the German Chancellor, Theobald von Bethmann-Hollweg, was scathing, together with the Russian resurgence at the hands of Bruslov, the loss of Bitolj to the Serbs, and the fall of Gorizia to Italy, the Kaiser finally decided to replace Falkenhayn with the more aggressive von Hindenburg on August 29, 1916 when he heard news of Romania’s declaration of war with Austria-Hungary. Falkenhayn was sent to the Transylvanian Front to command the Ninth Army. He defeated the Romanian army at the Battle of the Red Tower Pass on September 30, 1916, advancing towards Bucharest. Linking up with Mackensen's army in mid-November, Falkenhayn’s troops entered Bucharest on December 6, thereby defeating Romania. 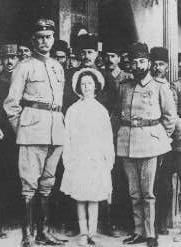 Falkenhayn was next dispatched to Palestine to command the Turkish forces in early 1917. A series of setbacks followed: he was defeated by General Allenby at Gaza on October 31, 1917, and Jerusalem fell to the British in December. Falkenhayn was dismissed by General Liman von Sanders in February 1918; upon his return to Germany he retired. Eric von Falkenhayn died on April 8, 1922 near Potsdam.